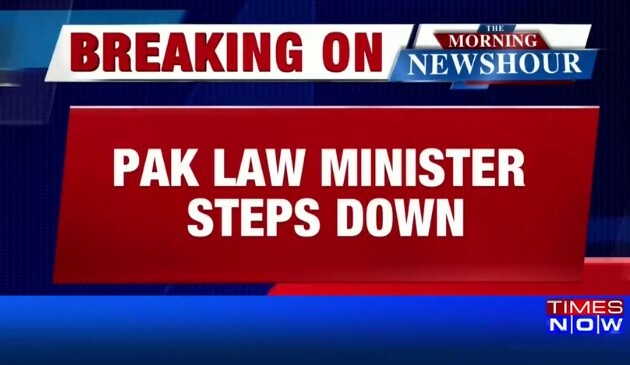 NEW DELHI: Pakistan's law minister Zahid Hamid resigned late on Sunday to bring the country "out of a state of crisis" after weeks-long protests by Islamists who said he "blasphemed", reported Pakistani media. The Islamists ended their three-week-long protests after Hamid's resignation.The Pakistani government and the protesters had earlier agreed the latter would end the protests if he resigned. "Our main demand has been accepted," said Ejaz Ashrafi, spokesman of the Tahreek-e-Labaik Islamist group, to Reuters. "Government will announce the law minister 's resignation and we will end our sit-in today." he added. The hardline protesters wanted Hamid to resign for what they said was a deliberate modification to the oath of office taken by politicians. They said the change amounted to blasphemy. The modification was called a "clerical error" and immediately removed but that didn't satisfy the hardline Muslim fundamentalists. "I made the decision to resign in a personal capacity," Hamid was quoted as saying by government sources, reported Dawn. The government's agreement with the hardliners followed a two-day face-off at Faizabad Interchange - gateway between the twin Pakistani cities of Rawalpindi and Islamabad - and other parts of the country between protesters and security forces that saw at least six people killed and hundreds injured. On Sunday, the hardliners clashed with security forces in Pakistan's capital and other cities officials said, paralysing Islamabad a day after a failed clearing operation killed several people and wounded some 150, reported Reuters yesterday. The religious activists burned several vehicles outside the capital before withdrawing in an uneasy stand-off at a protest camp they have occupied for two weeks, police said. Despite orders from the civilian government to the army on Saturday night to help restore order, no military troops were at the scene around the protest camp in Faizabad, on the outskirts of the capital, witnesses said. The military's press department did not respond to queries about the government's order. On Sunday evening, Interior Minister Ahsan Iqabal said the paramilitary Rangers force would be authorized to handle the demonstrations. 0 Response to "Under pressure from Islamists, Pakistan's law minister quits; hardliners end protests"